Sydney Lea reads at Three Bean Café during PoemTown Randolph last year. Most poets rarely see their work under the spotlight; it's understood that, for the majority of their career, they will read to small audiences or sell a few chapbooks in the local indie bookstore. However, in April, Vermont's verse peddlers will have the opportunity to see their work plastered in store windows throughout Randolph. The February 1 deadline to submit to the monthlong celebration approaches, so sharpen those pencils, poets. This will be the third iteration of PoemTown Randolph, inspired by the 5-year-old PoemCity Montpelier. Some 100 broadsides bearing (sometimes) metered verse will hang "in places absolutely visible to the passerby," says organizer Janet Watton. Special poetry events round out the month. 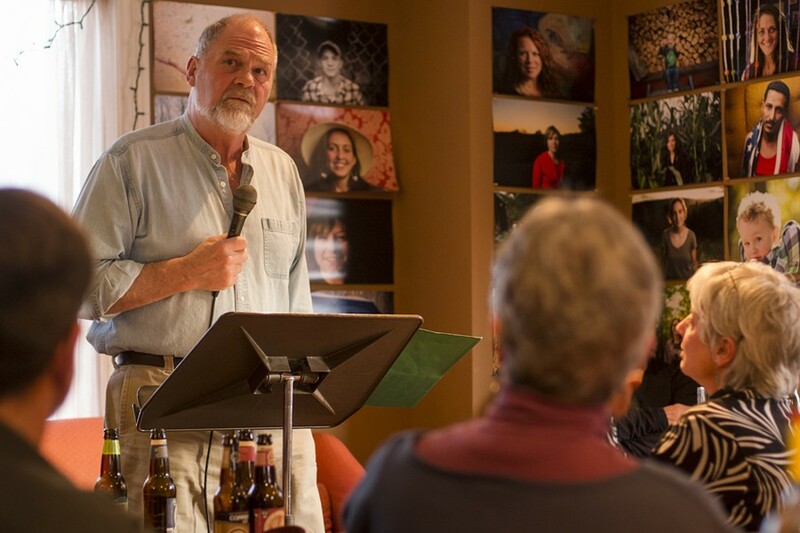 Last year, for example, former Vermont poet laureate Sydney Lea held a reading at the Three Bean Café (pictured). This year, organizers hope to get Lea's successor, Chard deNiord, on board. Given that the poems will be installed in public places, visible to even easily offended eyes, it's safe to say that intimate pieces à la Sharon Oldes' "The Knowing," or Marilyn Hacker's "Rondeau After a Transatlantic Telephone Call," may not receive due appreciation. But freedom (and free verse?) comes in many forms. "There is no prescribed subject matter," Watton says, "and there aren't really any topics or forms to be rejected. That said, if we have choices (i.e., more than 100 entries), we probably would not choose something extremely vulgar or offensive." PoemTown is a democratic event; you don't need to be a published poet to submit. Students, professional writers and amateurs of all ages and all geographic areas of Vermont are invited to send in their work for consideration. Watton and her co-organizers ask that poems be kept to 24 lines or less, typed or handwritten, and that the poet's name, town of residence, email and phone number be written on the back of the page, to ensure blind judging. 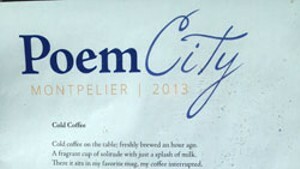 They also ask that poets not send previously published work, or pieces that have been used in PoemCity Montpelier or past PoemTown Randolph displays. Watton and co. are planning to compile a chapbook of selected poems, as they did last year, for purchase. The PoemTown Randolph festivities will close with an event at the Chandler Music Hall. "The response to the event [has been] wonderfully positive," Watton says. "People could be seen all the time stopping to read as they moved about their business on the streets, and commenting to one another as they passed by. There was a lovely buzz about it all month." Poets may send up to three pieces to Janet Watton, 1387 Davis Road, Randolph Center, VT 05061. For more info, contact her at musbird@gmail.com or 728-9402.